The New York utility wants to partner with a group of energy developers called Maine Power Express LLC to build a 630-megawatt wind facility in Penobscot and Aroostook counties. New York energy giant Con Edison hopes to partner with developers of new Maine wind farms to deliver power to Boston through a bid process under consideration in Massachusetts. The Bay State issued a request for proposals for clean energy earlier this year so it can meet its aggressive renewable energy goals. The RFP drew 46 bids by a July 27 deadline. Among them was a proposal from Central Maine Power Co. to build a transmission corridor through western Maine to deliver Quebec hydropower. Con Ed is proposing a partnership with a group of energy developers called Maine Power Express LLC to deliver northern Maine wind power to Boston markets. Under the plan, MPX would build a 630-megawatt wind facility in Penobscot and Aroostook counties called County Line Wind. 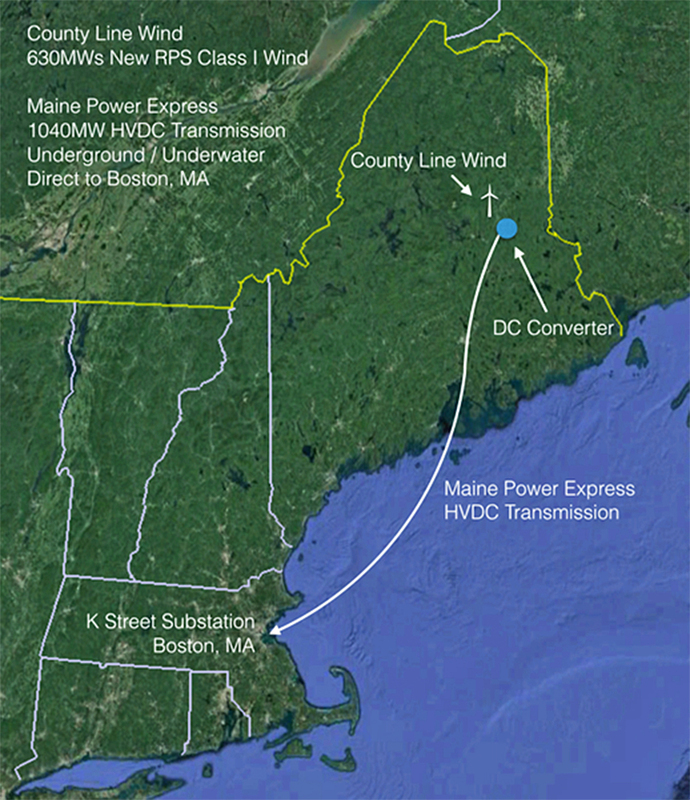 Then the partnership would deliver that power via an underground power line on an existing energy corridor that eventually connects to an underwater transmission line to Boston, according to a press release issued Wednesday. If the MPX project wins the Massachusetts Clean Energy RFP, it would sign a 20-year power purchase agreement with Massachusetts utilities regulators, according to the release. Construction of the wind farms and the transmission corridor would be complete by 2022, according to the bid. Massachusetts is expected to make its selection in January 2018. Con Edison is one of the nation’s largest investor-owned energy companies, with approximately $12 billion in annual revenues and $48 billion in assets. Maine Power Express LLC is a joint venture among Loring Holdings LLC, National Resources Energy LLC and Transmission Developers Inc. MPX LLC has a team of development and strategic partners to design, engineer, permit, finance, construct and operate the MPX project.